I’m crazy about vintage Barkcloth. Maybe it’s the design…..or the texture…..or the weave…or the bold colors. They just don’t make fabric like that anymore. 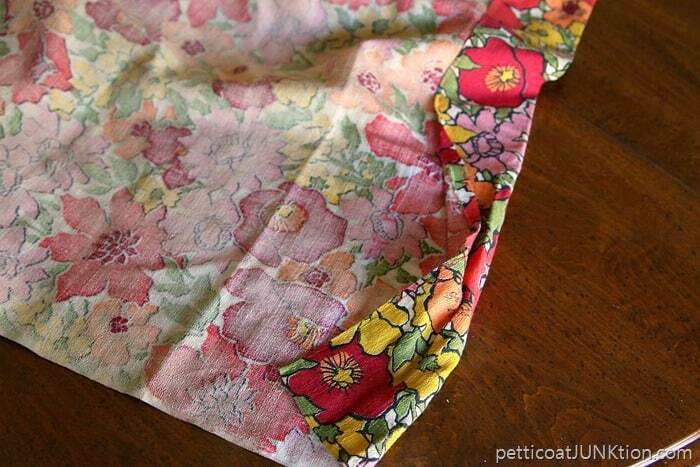 Vintage Barkcloth fabric from the 1920’s –1960’s isn’t made from tree bark. That’s how Barkcloth got it’s name. At one time it was made from the inner bark of a tree and the bark was beaten flat by some long drawn out process. Can you imagine that?? I found the curtain panel at the thrift store a long time ago. There was only one short panel. The design and the colors are me through and through. I ran across it while re-organizing my fabric stash. I decided then to pull it out and use it for something. Too pretty to sit in a box. 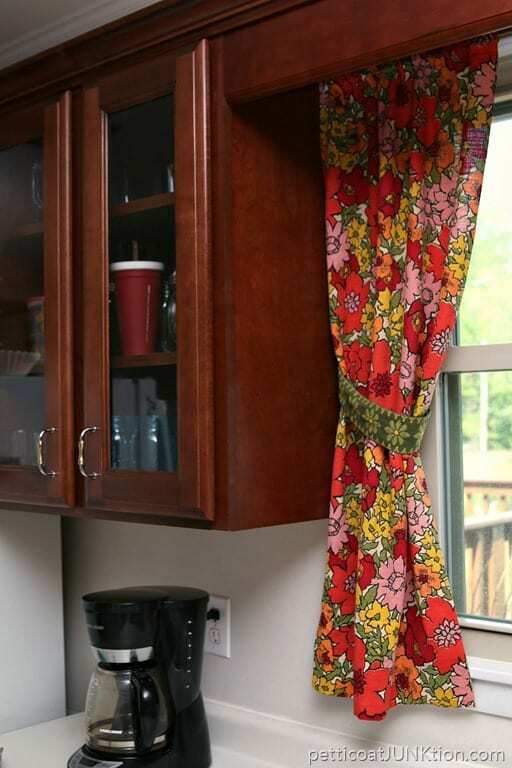 I made a new kitchen curtain out of the one panel. 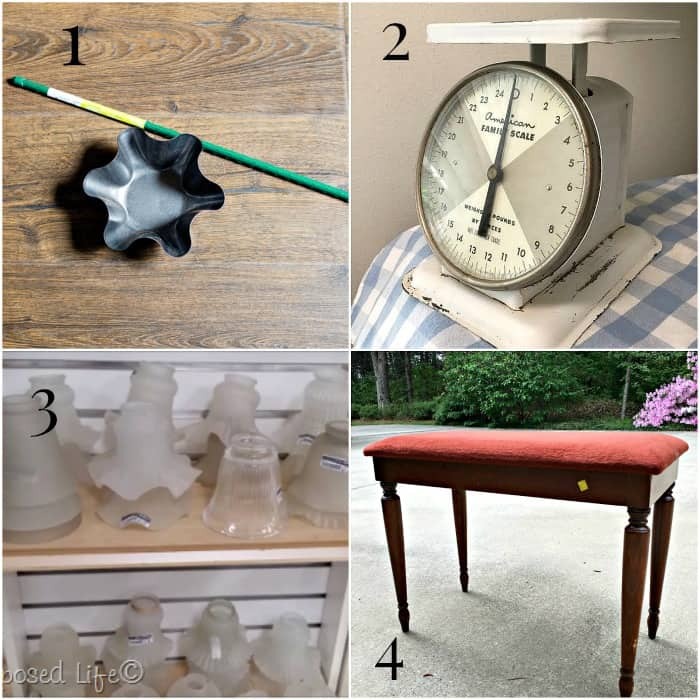 The other thrift décor girls have projects today too. 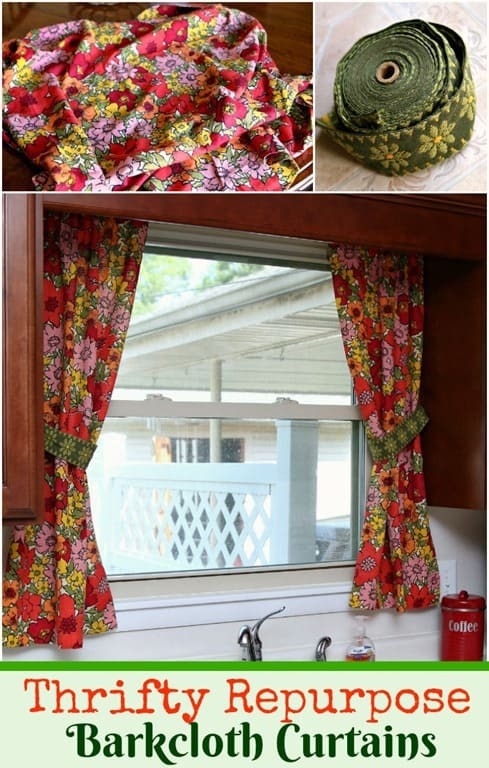 Don’t forget to check them out after seeing my crazy curtain project. 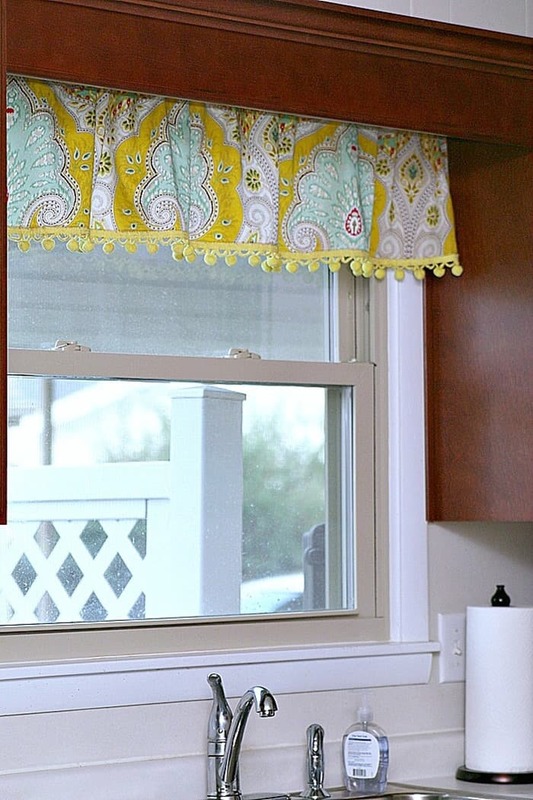 This is the cheery valance I made from a shower curtain back a few months ago. The whole project was a disaster. If you missed it you can read about it here…pom pom curtains. I really like the valance but that little bit of fabric doesn’t give much privacy. So I made these. A bit skimpy because of the fabric shortage but very colorful. 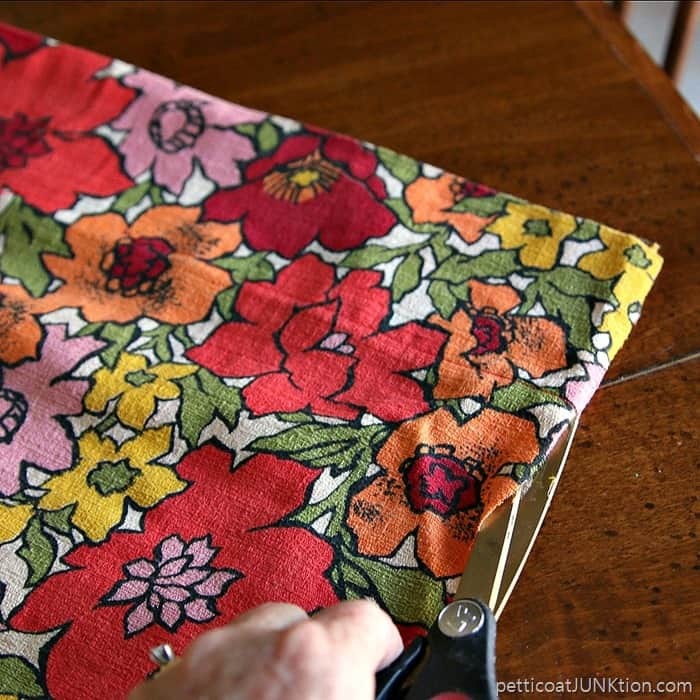 The original Barkcloth curtain panel was 42” by 42”. Not much to work with. 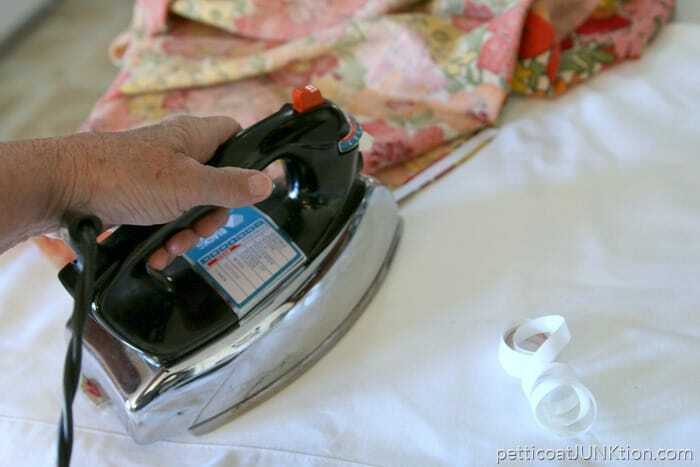 I fixed that right up with iron-on hem tape. Then I folded the panel in half and cut it. Not real precise but that’s me. I took the valance down and hung the new curtains on the same tension rod. This is the part of the story where you guys go “REALLY KATHY”. I didn’t hem the cut fabric. I hung the cut sides next to the cabinets. The curtain folds in so no one can see the edges….right?? Come on….admit it….you do things like this too. I’m okay with the curtains like this. It’s how I roll. The curtains definitely looked skimpy and unfinished hanging as is. 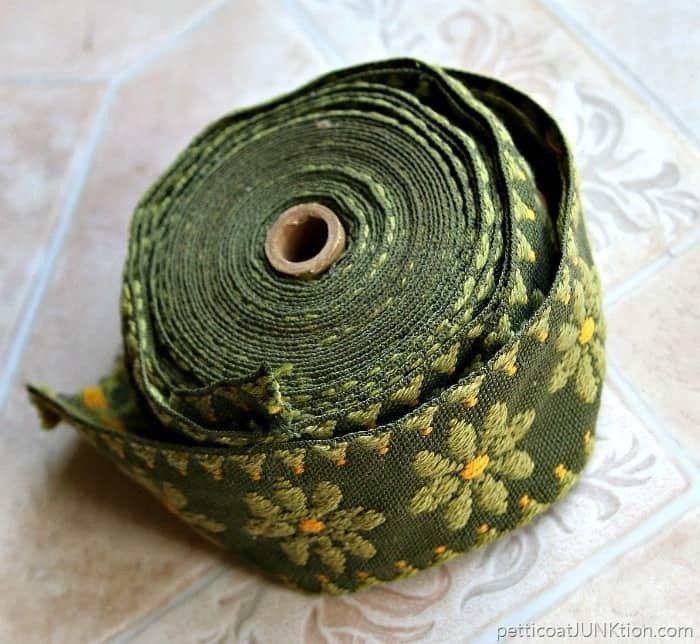 While searching for more pom pom fringe to use as a tieback I spotted the green and yellow fabric trim, a Goodwill purchase. I never pass up a good buy. 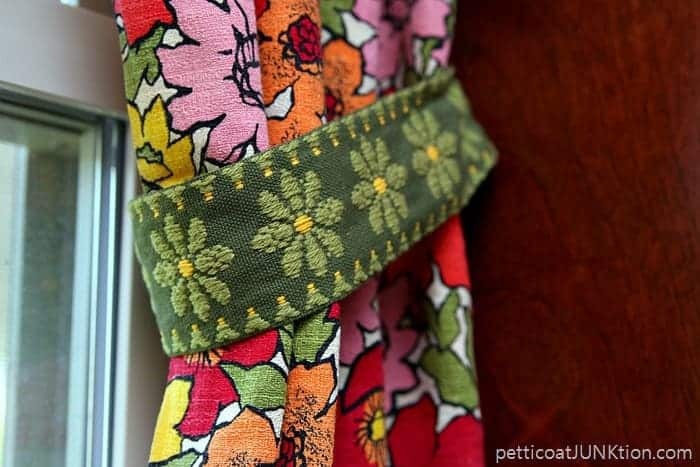 Well, how perfect is the flowered trim against the Barkcloth. 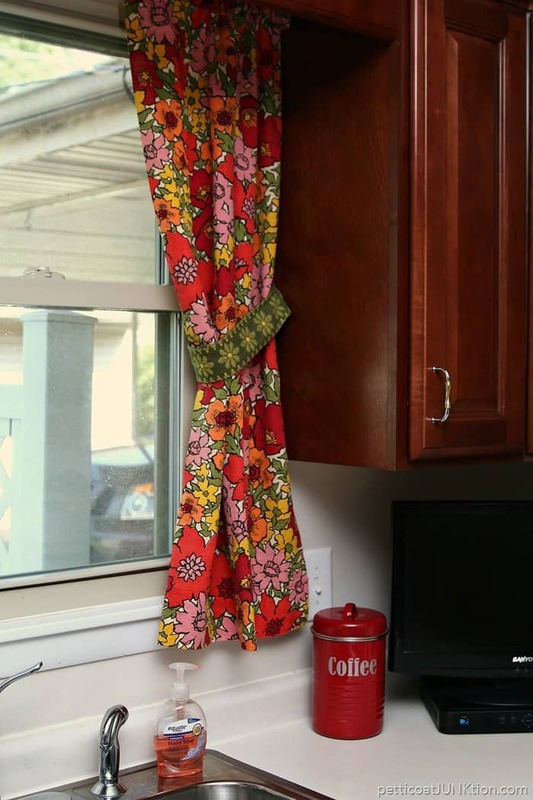 I’m loving the new curtains. They may be skimpy…..and a little imperfect….but they’re mine. You guys know they probably won’t be hanging in the kitchen window long but I’m going to enjoy them while they are. They make a bold statement. Do you do crazy things like I do when decorating? Leave me a note and visit the other thrifty projects by clicking the pink text links below the photo. Sign up for The Home Depot Do-It-Herself Workshop here. Have a great day and I’ll see you tomorrow. Thank you for posting. You do a great job articulating your thoughts and I really enjoy reading your site. You’ve created a very valuable resource here. Just wanted to say keep up the good work! How fun! Love the bright cheery colors! Kathy, You find the best treasures! 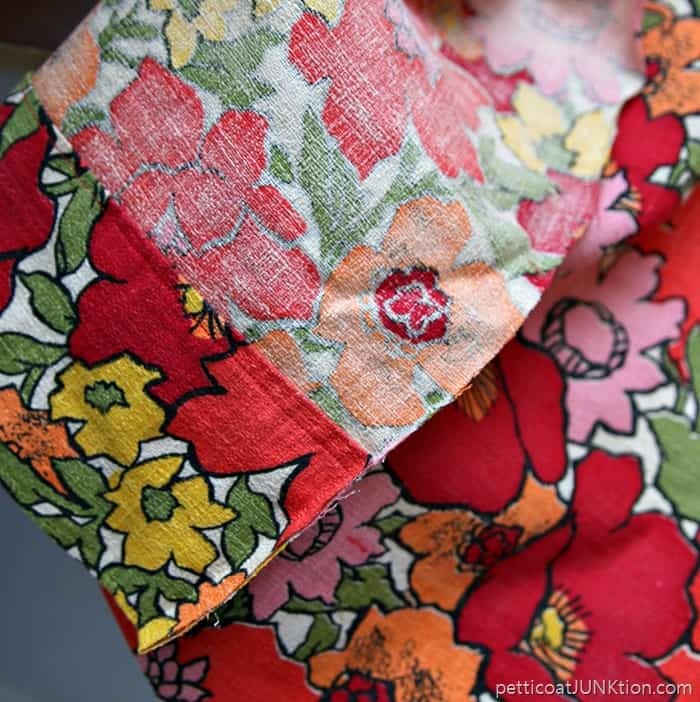 I just love this fabric….so cheery! I love the print, too. You couldn’t have found better tie backs if you’d searched the world over! Now…about not hemming the cut sides. I certainly would have. I would have removed the stitches from enough of the hem to double turn the sides in, stitched them, and res-stitched the open parts of the hems. That’s the way I am–very particular about details and things being finished. (There was a time when I did a lot of sewing (mostly clothes) and very good at it. Then fabric, patterns, zippers, etc., got to be more costly than buying off the rack.) Anyway, the unhemmed barkcloth will ravel terribly when laundered. 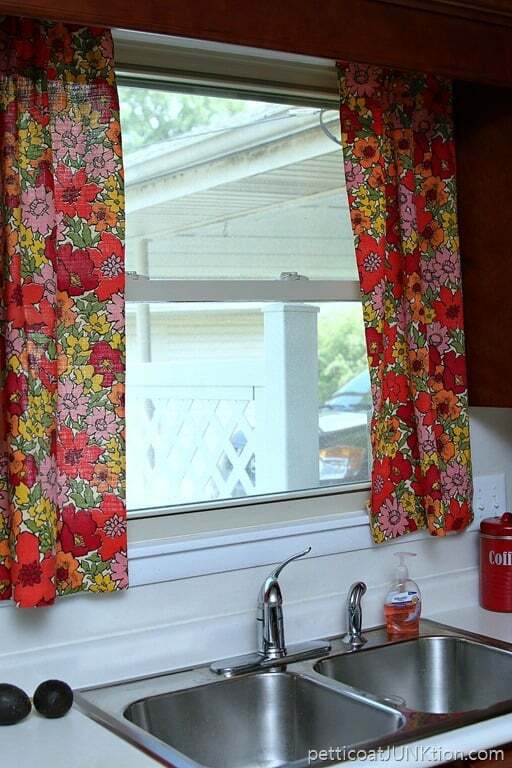 The curtains are very cheerful and the tie-backs just give them the touch they need. Now the boldly colorful pattern would not be one I would choose for my house but it is perfect for you because you love bright colors. And I, unlike you, would probably never have started them because I would have known at the beginning that I couldn’t do a “perfect” job with them. Now isn’t that sad! I think just going ahead and working with what you had says volumns (sp ?) about the benefits of taking a risk now and then! Bravo for you! I dub you one of my valuable role models! Truly! Thanks for a great post! ah Naomi. That was so nice! You just need to step outside the box and go for it. Don’t worry about perfection. I like the bold pattern! Where can you get barkcloth? Is that something that is still available? I don’t know if they make barkcloth anymore. I run across the vintage stuff at flea markets or thrift shops. 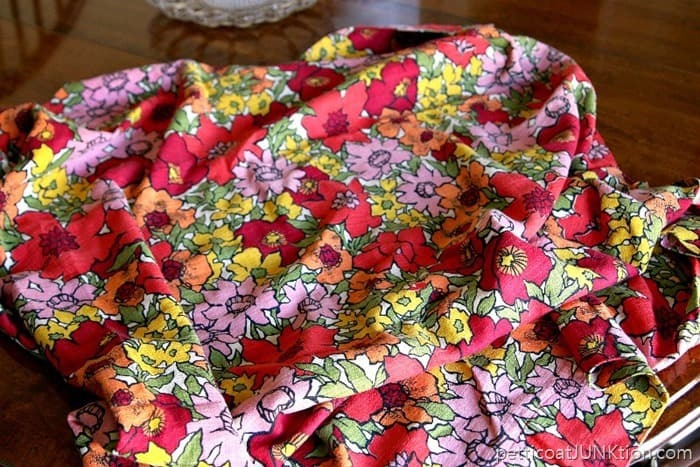 Love that fabric – so fun! Your barkcloth curtains turned out so cute! I love the bright and bold colors. HA! You are after my own heart, Kathy. I ALWAYS take shortcuts with my decorating projects where and whenever I can. My shortcuts are too many to list here. Have a wonderful day, my dear! I love the curtains – very late 1960’s! When you’re done with them they woud look cute on a chair or bench. 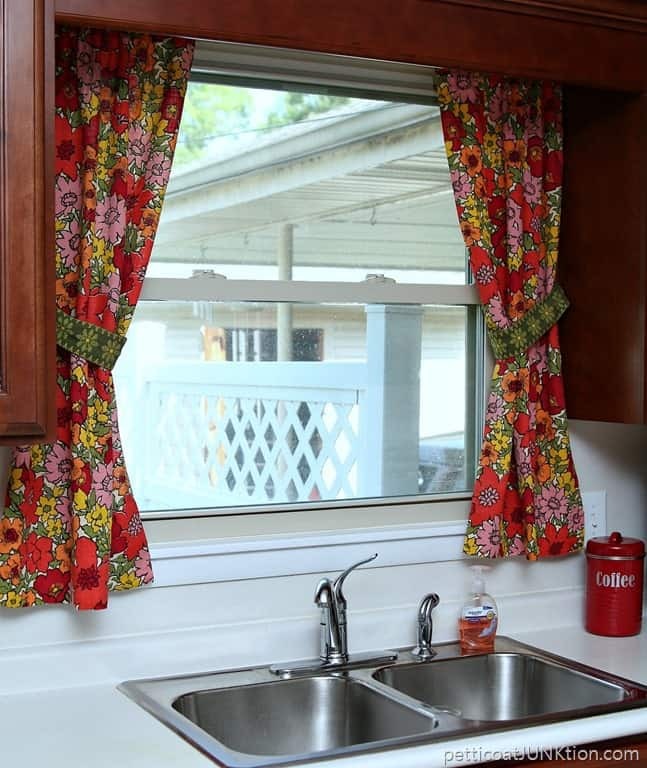 The curtains do perk up the wood cabinets. I like how you were able to skip the sewing part, which is drudgery as far as I’m concerned. Great makeover.